Civil engineer and contractor; born at Tauss, Bohemia, June 17, 1837; died in Chicago, Ill., Feb. 9, 1894. Gottlieb graduated from the University of Prague in 1861, and was at once employed on the Kaiser Francis-Joseph Railroad, then in process of construction. Though promoted to the position of principal assistant to the chief engineer of construction, he emigrated in 1866 to the United States and settled in Chicago, Ill., where, in 1868, he was appointed chief engineer of the American Bridge Works. In 1873 Gottlieb became Western agent of the Keystone Bridge Company; in 1877 he was elected president of the company, removing to Pittsburg. During his presidency he constructed the Susquehanna River bridge at Havre de Grace for the Baltimore and Ohio Railroad; the Point Pleasant bridge over the Ohio River for the Ohio Central Railroad; the Plattsmouth bridge over the Missouri River for the Burlington and Missouri River Railroad (the first steel-truss bridge erected in America); the Missouri River bridge at Blair Crossing, Nebraska; the New River Viaduct for the Cincinnati Southern Railway; the Monongahela River bridge at Pittsburg for the Pittsburg, Cincinnati, Chicago and St. Louis Railroad; the Madison Avenue bridge, New York city; the train-shed at Broad Street Station, Philadelphia; the Mexican Government Exposition and Mining Building at the New Orleans Exposition; the Sixth Avenue Elevated Railroad, New York city: and the New York approach to the East River bridge. 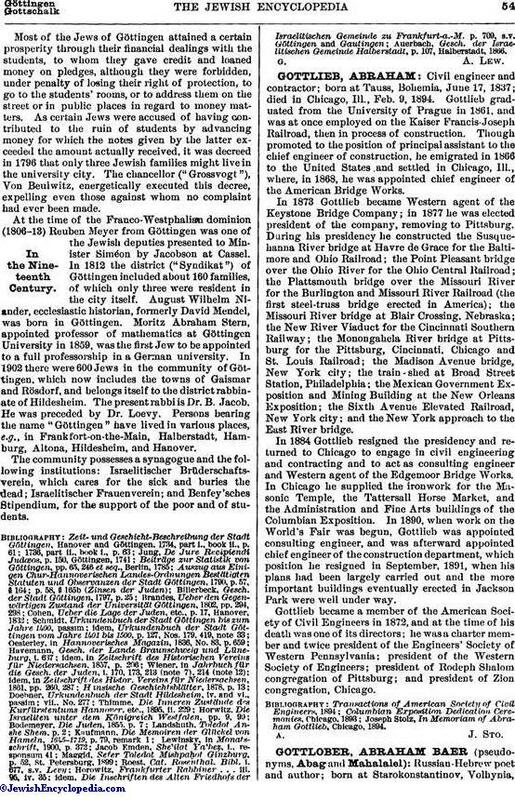 In 1884 Gottlieb resigned the presidency and returned to Chicago to engage in civil engineering and contracting and to act as consulting engineer and Western agent of the Edgemoor Bridge Works. In Chicago he supplied the ironwork for the Masonic Temple, the Tattersall Horse Market, and the Administration and Fine Arts buildings of the Columbian Exposition. In 1890, when work on the World's Fair was begun, Gottlieb was appointed consulting engineer, and was afterward appointed chief engineer of the construction department, which position he resigned in September, 1891, when his plans had been largely carried out and the more important buildings eventually erected in Jackson Park were well under way. Gottlieb became a member of the American Society of Civil Engineers in 1872, and at the time of his death was one of its directors; he was a charter member and twice president of the Engineers' Society of Western Pennsylvania; president of the Western Society of Engineers; president of Rodeph Shalom congregation of Pittsburg; and president of Zion congregation, Chicago. Joseph Stolz, In Memoriam of Abraham Gottlieb, Chicago, 1894.